“Welcome to the witching hour,” said Verses festival director Jillian Christmas on Tuesday, April 24th. Gathered in the dark room of The Wise Hall, tea-lights twinkling, and moon phase flags strung along a table at the front, it certainly felt like we had all gathered for some witchy rituals. The sun blazed outside, the air was warm, but we were hidden away from the outside world, ready to breathe words of passion, and evoke the mystic. 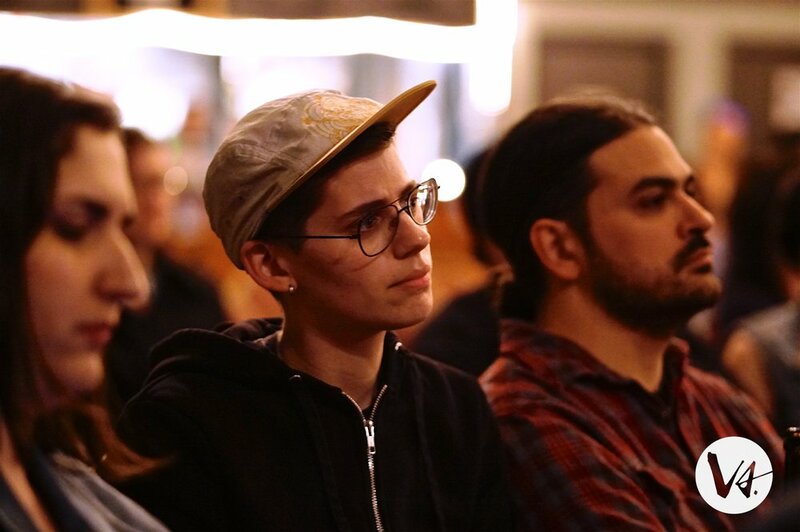 As Jillian Christmas continued her introduction, she acknowledged that “sometimes when listening to poetry you might hear things that you’re not prepared for.” Understandably, the emotional content of some poems can trigger unpleasant feelings or memories. Verses festival recognizes this, and provides the audience with “active listeners,” visible by their glow-stick necklaces. Their purpose is to be a willing ear if you need to talk through any stirred-up emotions, and offer resources if you want to seek further support. The active listeners also serve as a liaison between festival-goers and the busy organizers. If there was something that you loved or hated, they want to know about it, and the active listeners are there to pass it on. 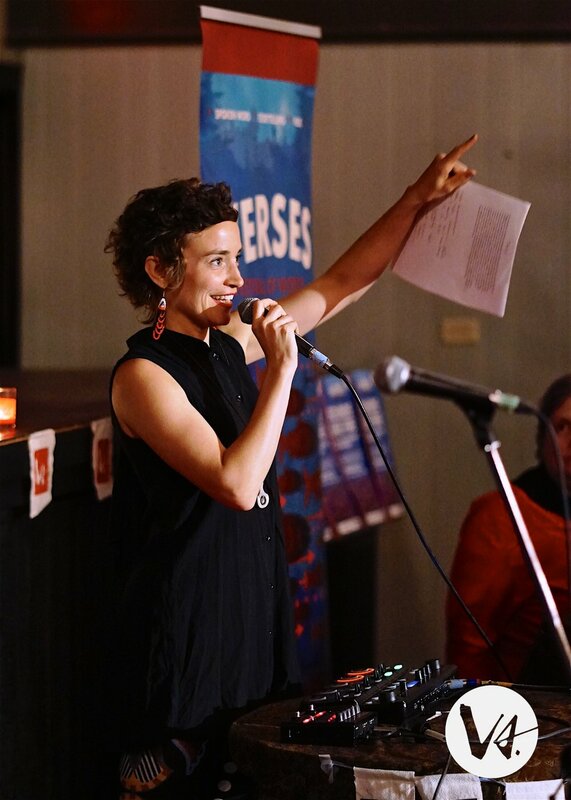 The Witching Hour, one of the many events offered by this year’s Verses Festival of Words, was a triple book launch. It was a juicy hour-and-a-half, with readings from Joelle Barron’s Ritual Lights, Ellie Sawatzky’s Rhinocerotic, and Alessandra Naccaroto’s Highly Sensitive Femme. Jaye Simpson warmed up the night with their poetry and infectious excitement. Partway through a poem, they stopped and said “oh my gosh y’all, this is an older version of the poem—you know what, I’m just going to finish it.” Simpson was undeterred, and the audience only seemed to enjoy the reading more when the writer continued to read with unwavering confidence. Moe Clark, poet, musician, and host of the night, introduced each writer by announcing both their literary accomplishments and star signs. She was speaking to the right crowd; every mention of an author’s sign was met with knowing oohs and hmms from the audience. In all three of the books the authors read from, there were moments that were at once haunting and comforting, as the everyday was married with the magical. Needless to say, Persephone was mentioned numerous times. Highlights were Barron’s poetry about her daughter, which acted like an intimate and honest love letter; Sawatzky’s poem about going to Burning Man with the little girl she nannies, and Naccaroto’s list that helped the audience determine if they too were a highly sensitive femme. Naccaroto performed one last poem with the help of Moe Clark, who supplied hypnotising loops of her voice to create a beat for Naccaroto’s words, reinforcing their power. Festival goers were invited to stay for tarot readings before the next event began.